Hello is a short film written and directed by John Helde. It premiered at the Seattle International Film Festival in May 2005. It won the IFP/Seattle Spotlight Award and an award for Best Short Film Casting from the Casting Society of America. The film is available on Hulu. 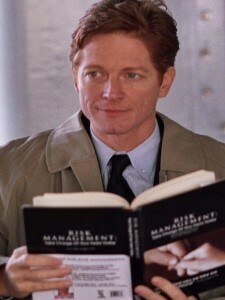 When Max (Eric Stoltz), urged on by “Risk Management,” a self-help book for the hapless, decides to approach his fellow ferry-commuter Rory, he hopes simply saying hello might change his life for the better. But Rory only accepts contact by contract. Max finds he can play along. As the two negotiate a whirlwind relationship on paper, Rory slowly lets down her guard; but when her unresolved personal life intervenes in the form of Donald, Max must manage a little more risk than he bargained on. Tell me about your two films that screened at the festival. “Hello” is a twenty-minute short with Eric Stoltz, Susanna Thompson, and Kevin Tighe, about a ferry commuter who tries to change his life with unexpected results. “Made in China” is a feature documentary about a family subject – my father grew up as an American in pre-World War II China and I set out to explore that part of his life and the idea of growing up with a foot in two cultures, something that was alien to me. The films “Hello” and “Made in China” couldn’t be more different – did you find that making the narrative short or documentary feature was more challenging than the other? Both were challenging in very different ways. Like so many shorts, “Hello” was shot in a very short time frame, much of it on a moving ferry – we timed our shoot schedule to the ferry schedule. That certainly helped us not go overtime. It was always like “well, we’ve got half an hour to get this shot while the sun is at that angle and the ferry’s going this direction, and then that’s it.” But we had a lot of fun making the film, with an incredibly talented cast and crew.